Bill Saunders Handsigned and Numbered Limited Edition Giclee on Canvas :"Falling Leaves"
About the Art: Bill Saunders started sketching at the age of four and painting when he was twelve. The scenery of Quebec, was the source of this Montreal native's inspiration. 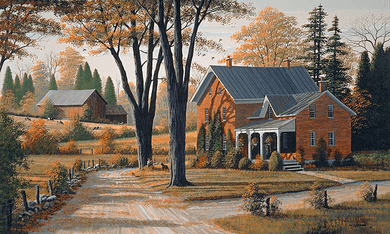 Rural scenes and rustic surroundings came alive with his brush. 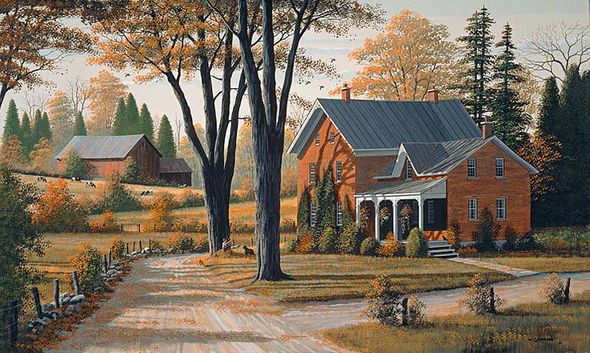 He painted the farmlands of Quebec and Ontario capturing the timeless serenity of an aged farmhouse on a lonely country road or a sugar shack hidden in a forest of maples. Realism is Bill's favoured approach. His paintings capture the smallest details, preserving scenes of a quiet, compelling world. Saunders' work can be found in galleries and private collections throughout Canada and parts of the United States.